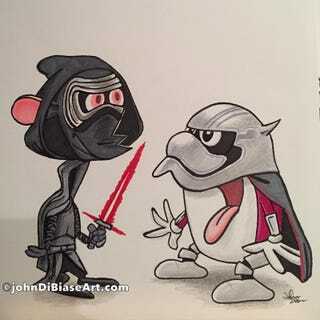 It’s pretty obvious to me that if there is a Kylo Ren, there has to be a Kylo Stimpy. Think about it, Yoda himself once told us there are always 2, a master and an apprentice (I don’t count that scorched Mr. Staypuff hologram they showed us in the movie). A quick Google search shows that I’m not the only one who’s thought of this. 1. I very much enjoyed the characters and their personal stories, both the old ones and the new. I think the idea of having a stormtrooper break out of the mold is brilliant. It’s the stories about people that make the movie. 2. Special effects and action were fantastic. Incredibly fun movie to watch. 4. A weapon that can fire across interstellar space to shoot other planets in real time stretches my ability to suspend disbelief even for a Star Wars movie. I guess I shouldn’t be surprised since J.J. Abrams is the one who gave us a transporter that can go from Earth to the Klingon Empire. 5. A personal peeve: No way that BB8 droid can roll down that flight of steps slowly and in full control when his diameter is larger than the step size. Trust me; done it. 6. Occurs to me that David Wenham would be perfect in the role of the First Order general. A missed casting opportunity.